WEST FACADE. 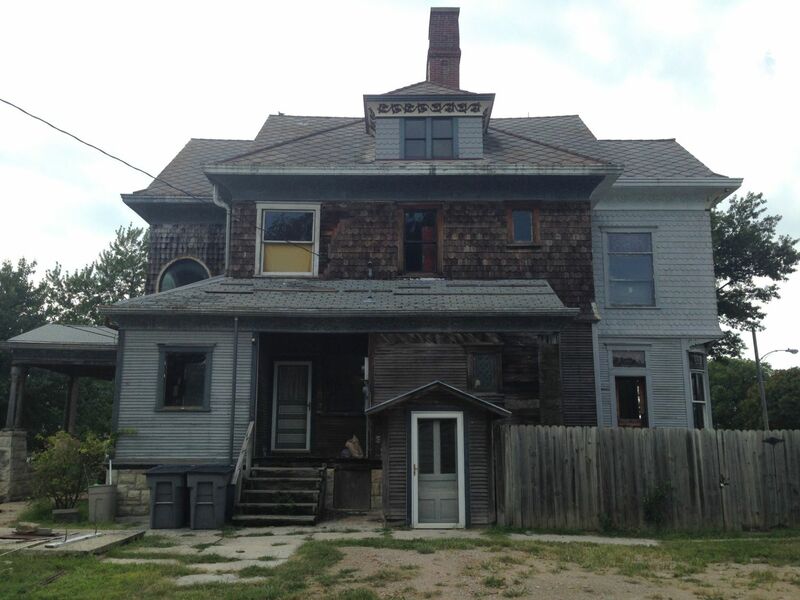 The Cross House when I purchased it, March 2014. WEST FACADE. August, 2015. The recreated porch railings are completed, and stored away for now. I need to order the spindles (which I will do after paying off the radiator invoice). The lattice (for under the porch) is being worked on. The third-floor windows to the dormer and octagon tower are a project for this winter, and will be reinstalled in 2016. 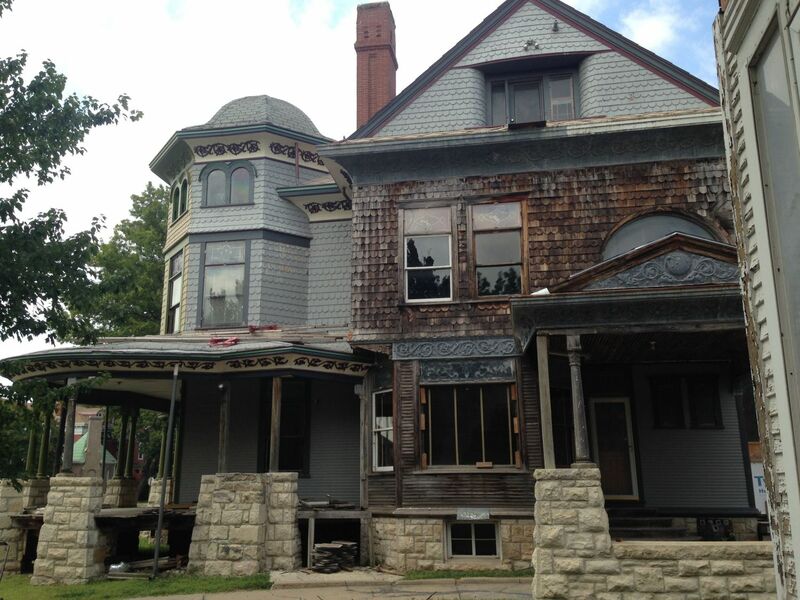 The tower roof, octagon roof, and porch roof will be done in 2016. That is the carriage house to the left, and with its own octagon tower. NORTH FACADE. As the house sits on a highly visible corner, the north facade is also highly visible. The plan (as evidenced by the scaffolding) was to get the north facade painted this year. But then a tenant wanted to move into the carriage house by the end of the year. Well, there went my plans! And now the carriage house is consuming all my attention. It causes me considerable pain that the poor north facade has been abandoned. Sigh. UPDATE: Painting the north facade will begin in the spring of 2016. EAST FACADE. As one drives west on Sixth Avenue (adjacent to the house) the east facade is also highly visible. The one-story roof will be redone in 2016, and the basement entry shed, not original, will be removed, as will the fence. The yard is now parking, but will be, one day, a verdant walled garden. I cannot wait. Oh, the brown siding is bare wood. SOUTH FACADE, looking east. Oh dear. I removed the massive black fire escape leading up to the third floor as this blighted the house. All the old lead-based paint was removed by the previous owner (Thank you, Bob! ), but the wood was not primed. SOUTH FACADE, looking west. A fine view of the octagon tower. Note the curvaceous shingling around the third-floor window. It is quite distressing looking at these images. One way I manage such a huge project is to simply blot out All The Work Needing To Be Done, a kinda self-invoked selective blindness. Instead, I focus on work which has been completed. I have been determined to paint the whole exterior by myself, as nothing offers a better acquaintance with a big old house than touching every square inch of its exterior. I love learning about the house, and discovering its high, inaccessible spaces. Which, inevitably, reveals small horrors needing attending to. But looking at these terrifying images makes me wonder about my plans. Can I survive the exterior looking so poorly for years and years to come? I feel nauseated at the very thought. Where is a fainting couch when needed? Ross, I am a relatively new follower to your restoration site and I have to say that what you have accomplished so far is truly amazing. A 10 year plan is acceptable I think. 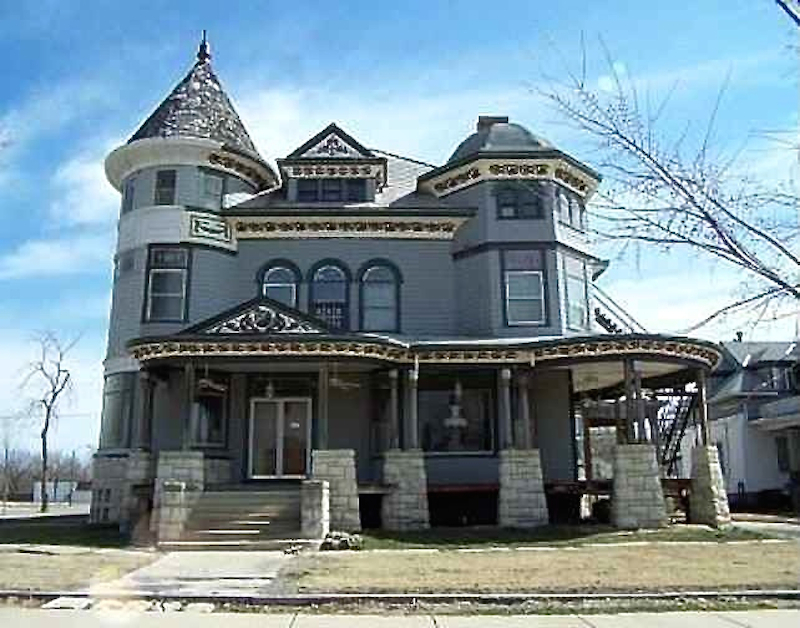 We started working on our Victorian in 1989 and are still doing projects that were around back then. This fall we are planning on continuing our ongoing exterior painting. Painting is never truly complete when you have an old house. 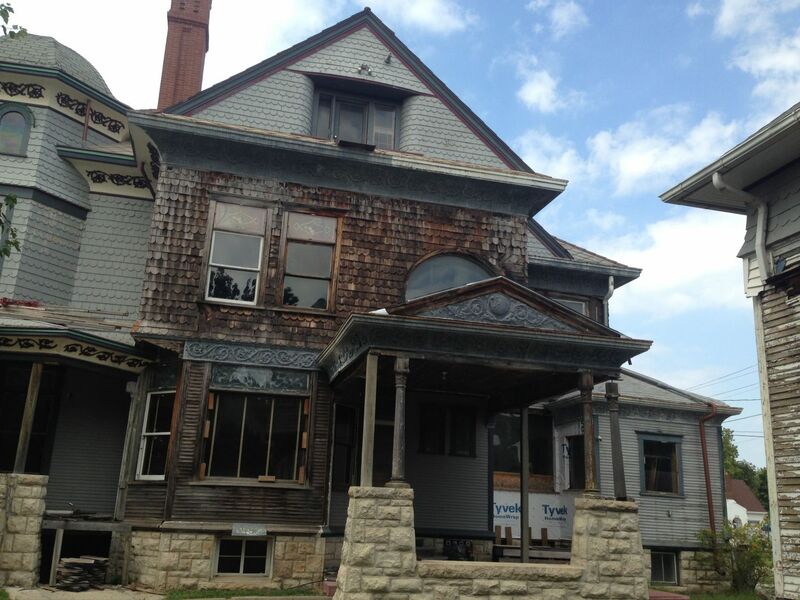 I know the restoration of the Cross House will be never-ending. And I am OK with this reality. Well, sorta! But…I had still hoped to get the north facade painted this year. I was SO excited about this! But now I just feel dashed. I love reading your posts. I think about this house all the time and the history it holds for my family. I am forever grateful someone like you is caring for it now and actually has a human feeling for the house. Just think of all the families it has been home to, and the millions of inaccessible square inches that could tell an amazing tale. From the Mouse family, thank you Ross for mothering a bit of our history. Merryl, you are a peach! And your father, and your grandfather, without question saved the house during perilous times! Our house was built in 1928. Sometime during the 1960s every last crack between the cedar shingles was caulked to appear as the then fashionable wide aluminum siding. We bought the house in 1989 and even though we were in our late 30s, it took us four long summers to remove the caulk and old paint with heat guns and 5 in 1s and sand down the cedar. We had the scaffolding up forever! The good(?) news is that paint job lasted 20+ years. It only took my considerably older husband and me two summers to repaint two years ago. This spring, a realtor was walking the neighborhood trying to drum up listings and as we were out in the yard, asked if we would be interested in selling. The realtor asked if that was new vinyl siding on our house! Moral of the story – take all the time you need to do it right. You will survive and the Cross House will prosper from your stewardship. Yikes! What your poor house had to endure! Thank goodness for you and your husband! 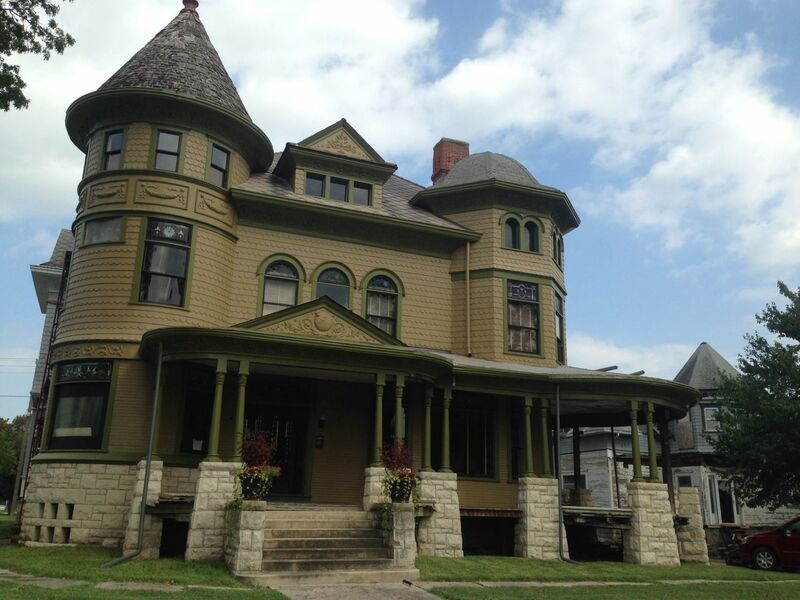 I’ve only seen the Cross House online, but every time a new pic is uploaded, my day becomes just a little better. If it meant another facade gets a facelift that much sooner, I would definitely donate to a gofundme campaign. And I bet everyone at OHD would pitch in as well. Traci! What a tantalizing thought! Hey Ross! Thought I would catch up with you on your OWN blog rather than on OHD, because I have a question that you probably have the answer to! On your fabulous Cross House, the cornices are made of a stamped or pressed tin(?) metal, correct? Assuming that my guess is right, lets travel to Delphi IN and talk about that wondrous pile of c.1899 house. I am in the process of helping out the new owners (omg!! ), and I was wondering how you painted the exterior metal elements on the Cross House…because on the Bowen House in Delphi, if you look closely near the top of the tower, there is a beautiful swag motif panel wrapping around it above the gutter, thereby giving the tower the look of a ‘crown’, and there are also a couple other pieces of decorative stamped panels on the house, such as the one above the dormer above the tower, and yet another hidden in the gable of the west side porch…all of these pieces I mentioned are in remarkably good shape. No rust, no corrosion, they just dont look that great. Rust colored surface streaks, minimal peeling paint, etc. So my question to you, is when painting your metal cornices, what is your approach? Do you give them a good cleaning before primimg and painting and go about your merry way, or do you have them sandblasted or stripped down to bare metal first before any painting is done? Insight and advice would be much appreciated! 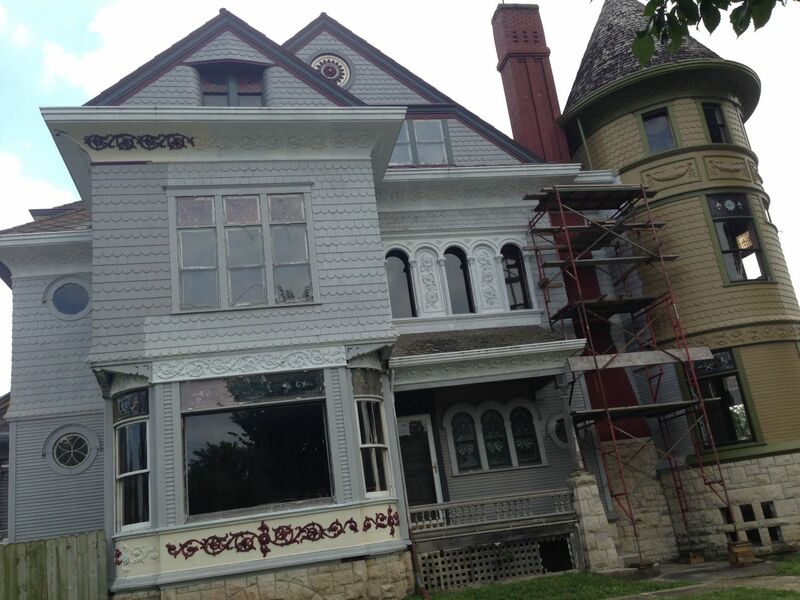 Yes, the huge curved exterior cornices of the Cross House are tin, and with applied tin decorative swirls. The previous owner scrapped off all the old paint, so I am dealing with new paint, and bare metal. What Delphi should do is get down to bare metal, ideally, and then use a quality oil-based primer. NOTE: Old paint has lead in it, so please use the proper precautions! You’ve got a deliberate and steady plan, which will ensure you get it completed, which is more important than a specific timeline. You’re keeping the important parts preserved while they await full restoration, so it’s just a matter of patience. It’s hard to look at the incomplete areas now, but you’ll get them done :-). I love seeing your steady, incremental process, and I absolutely share your sentiment of knowing the house over every square inch. It will also reward you in better appearance, and durability. The exterior work I did 3 years ago looks just like the day after the paint dried, while neighbor’s who hired the absolute lowered the bidder to do their work have paint peeling off in the same passage of time. I’m several years into the exterior restoration on our house, and am going through very similar experience. After doing one whole wide three years ago, I took the next year off to redo the garage and driveway, then tackled another 1.5 sides last year, then took another detour this year when I redid the backyard and patio instead (I had an offer I couldn’t refuse: free labor and equipment!). I squeezed in wrapping up the half side leftover, but the entire front and porch still await my attention. If life cooperates, I’ll tackle that next summer, but if not, I’ll keep the water out and prevent further damage until I have adequate time to devote to the full job.